Seven hikers participated in the trip to north side of Logan Peak: Jim (the leader), Gary, Roddy, Dave W., Jane, Denis and Allie. 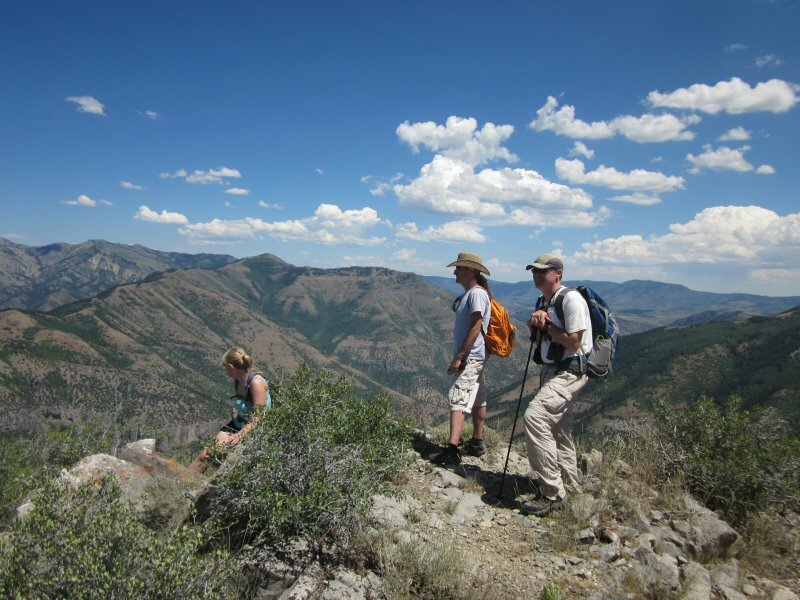 We call this the "North Syncline" trail, but the official name is the "Logan Dry-Mill Hollow" trail. This trip started at the Logan Dry Canyon trailhead at Logan's Cliffside neighborhood. We enjoyed good views of the rocky ridges along the canyon sides, melodious canyon wrens and ripe thimble berries as we trudged up the first four miles of steep but mostly shady trail (Jane turned back after 3 1/2 miles). Home-made signs attached to a tree marked the junction of the Syncline South trail at 3.6 miles, but we stayed on the Logan Dry Canyon trail as it left the canyon bottom and angled up the hot, open slope toward the northeast. We got a refreshing drink from the cool, clear water flowing from the spring at 4.4 miles, and a sign at 4.8 miles marked the end of the Logan Dry Canyon trail and the beginning of the motorcycle-legal Logan Dry - Mill Hollow trail. 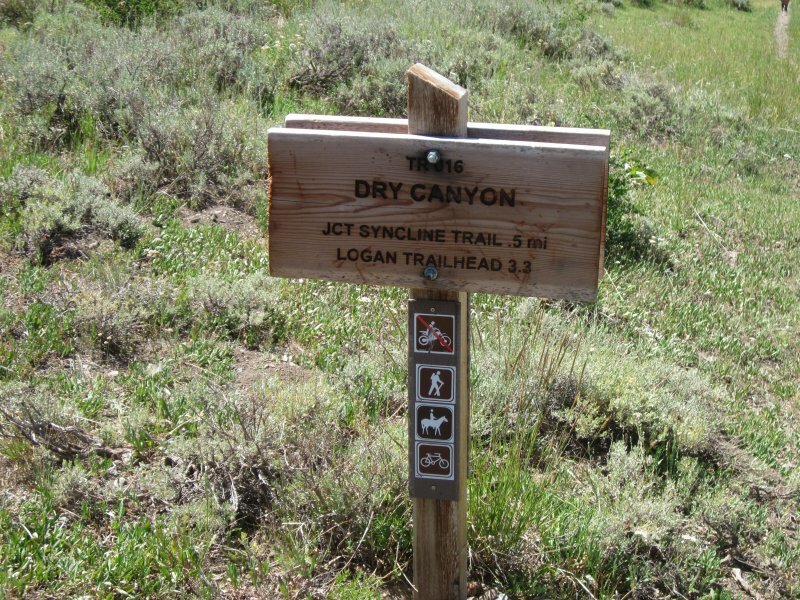 The sign is inaccurate, however, since it says the Syncline junction is 0.5 miles away (our GPS showed 1.2 miles) and the and the trailhead is 3.3 miles (our GPS showed 4.8 miles). 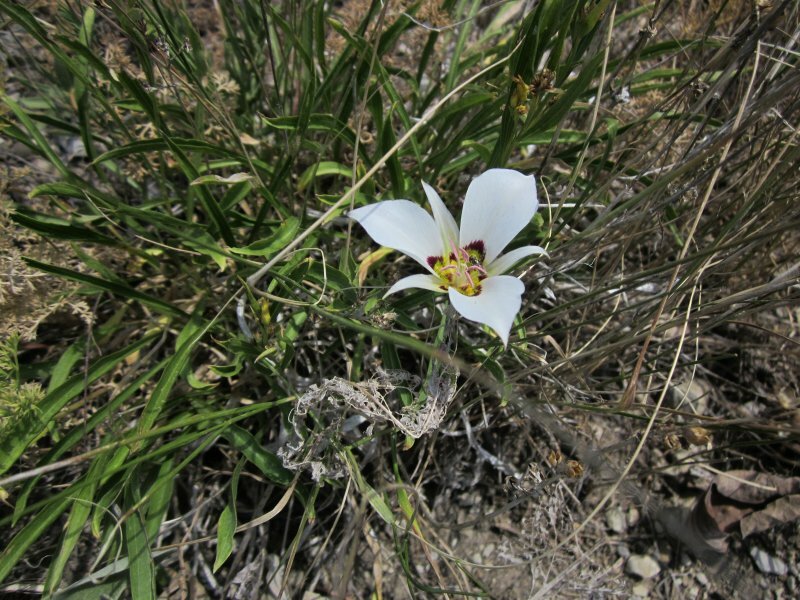 After eating lunch in the shade about mile 5.5, we left the trail and went a short distance further to a sunny point with great views of Logan Canyon to the east and Logan city to the west - and there were sego lilies, too. We returned to the trailhead about 4:00 after an uneventful walk back down the trail. The total distance for this trip was 11 miles with 3200 feet of elevation gain.